It takes a lot to be a champion; determination, skill, confidence, and of course - a cool shirt! The Razor Shutter Edition T-Shirt! 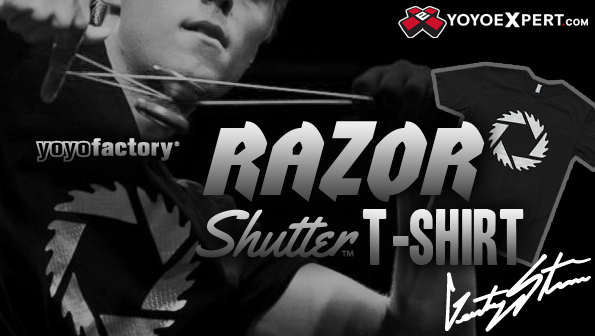 This new YoYoFactory Razor Shutter Shirt is the same shirt Gentry Stein wore when he took 1st place at the World Yo-Yo Contest! Now, we aren't saying that he won because he was wearing this cool shirt, and we definitely aren't saying this shirt will make you a better yo-yo player, but it can't hurt! Printed on a fitted Next Level T-Shirt, the Razor Shutter T-Shirt is super comfortable and is quickly becoming one of our favorite YoYoFactory Shirts!